This chapter deals with oxidative polymerization of aromatic monomers catalyzed by enzyme-model complexes to produce poly(aromatic)s. The enzyme-model complexes include Fe/porphyrin complexes and Fe/N,N′-bis(salicylidene)ethylenediamine complexes as Fe-containing peroxidase-models, Cu complexes having three nitrogen coordination atoms as Cu-containing monooxygenase models, and multinuclear Cu complexes as Cu-containing oxidase models. By using the enzyme-model complex catalysts, the aromatic monomers such as phenols, anilines, and pyrroles can be polymerized with H2O2 or O2 as oxidants at ordinary temperatures in environmentally benign manners. The obtained poly(aromatic)s like polyphenols, poly(phenylene oxide)s, polyanilines, and polypyrroles possess excellent characteristics in mechanical strength, heat-resistance, and electric property. Enzyme-model catalysts have the following advantages in comparison with enzyme catalysts: (1) lower cost that is important in practical use, (2) applicability in various reaction conditions and monomers, and (3) possibility to express unique functions that have not seen even in enzymes. 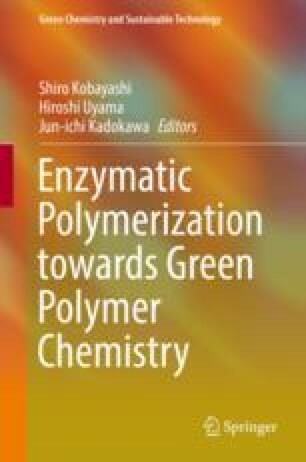 Hence, oxidative polymerization of aromatic monomers by enzyme-model complex catalysts would be expected as one of the new synthetic methods for advanced materials in green polymer chemistry.